On the fringes of the libertarian movement today are those who enthusiastically advocate "anarchism" as the alleged goal of libertarianism. There are two main factions within this anarchist camp: those which may be characterized as "anarcho-pacifists" and those which may be called "anarcho-statists" (or what I have called "polyarchal vigilantists"). Like the vast majority of libertarians and Libertarians (as well as conservatives), I disagree with both these "anarchist" positions. As I will explain, I support the Laissez-Faire Republic as the true goal of libertarianism and the real opposite of totalitarian statism. Although I am a great admirer of Robert LeFevre and the late Professor Andrew Galambos, and have few differences with what I know of their views in general, I do disagree on some points. The system which Dr. Galambos advocated involves the use of purely prophylactic (non-violent, non-political) mechanisms for protecting property boundaries from criminal tresspass. I enthusiastically support and encourage the development of such defense-in-advance mechanisms to prevent crime -- better locks, stronger doors, more effective burglar alarms, perhaps perimeter force fields in the future . . . . but I contend that for every new kind of lock invented, some criminal or potential criminal can eventually figure out how to "pick" that lock using the same technology on which it is based. As such technological defenses against crime become more sophisticated, the criminals learn to become more sophisticated in undoing them or getting past them. Of course, if such defense-in-advance mechanisms as locks on doors, burglar alarms, night watchmen, force fields, etc. could deter crime 100 percent, and the technology on which they depended was not accessible by the criminal element, then (theoretically at least) there would never be any crime -- and, presumably, no need for political government or any other criminal justice system. But, as I said before, the problem is that criminals eventually learn to "pick" each new lock that comes along from the mind of inventors. Beyond that, moreover, is that human beings have freedom of will so that a man may be a good citizen and respect the property of his neighbors one day and yet decide to act in a criminal manner the next by resorting to theft if he thinks he can get away with it. It is mainly for these two reasons that I see the need for some kind of political government to provide after-the-fact attention to crime, imperfect though that approach admittedly is. The fact that it is imperfect does not argue convincingly against the need for it. It seems to me that the need for after-the-fact attempts at criminal justice arises precisely from the fact that defense-in-advance mechanisms against crime (initiatory violence) are (as yet) imperfect themselves in preventing crime in the first place. Furthermore, I disagree with both Galambos and LeFevre in their rejection of retaliatory violence since I believe that when a person initiates (starts) the use of violence he automatically forfeits (gives up) his right to be left alone by violence. As long as an adult citizen is peaceful and does not initiate violence against the person, liberty, or property of others, he should be free from coercive interference by society (other people, including the government) in an ideal world. But that right to be left alone is not kept by a person who himself violates the rights of others to be left alone by his initiating violence, force, or fraud against them. It is for this reason that I disagree with those who believe that the LeFevrian or Galambosian positions are somehow more "pure" or consistent because of their essentially pacifist stance. By failing to recognize the distinction between initiatory violence and retaliatory force in the pursuit of justice, their pacifism would lead those few who would adhere to it to be victims of those (criminals) who would not. While eschewing all violence, including retaliatory as well as initiatory, may seem more noble or consistent on the surface, it is actually an error based on a faulty understanding of natural rights. I disagree with their belief that a person always retains the right to be left alone no matter what he does to others, even including criminal violence against them. The right to be left alone by society is a self-limiting principle; it is limited to peaceful people and does not extend to those who themselves use violence to violate the right of others to be left alone in their persons and properties. This conditional nature of the right to be left alone is integral to the principle of natural rights and goes back to John Locke and even earlier. Therefore, I disagree that pacifism is a logical deduction from natural individual rights. It is obvious that Thomas Jefferson never meant that rights are "unalienable" in that sense. So, this takes us back to the big question of political philosophy: how are peaceful citizens to be protected against their protectors (government agents) if and when those agents become corrupted and become criminals themselves or allies with the criminals -- as they have done? This is where the idea of the Laissez-Faire Republic comes in. For it is only by restricting government to a policy of laissez faire that we can prevent violent force being used to favor some special interests at the expense of others, and it is only through such a policy that individual freedom may flourish within a social context, based on the rule of law of a constitutional republic. You may ask: what hope is there for the actual achievement of such a Republic? Is it practical? We know what has worked in the past -- at least what worked quite well compared to other systems -- the Anglo-American Constitutional Republic as it has evolved in fits and spurts from the narrow class demands in the Magna Carta of 1215 to the idea of the universal rights of peaceful adult humans as expressed in the American Declaration of Independence and the U.S. Bill of Rights, and as refined by modern libertarian scholars. On my website I include a section on the major historical documents which comprise the (mainly) Anglo-American tradition of limiting the scope of government (originally the King and his agents) by constitutional law and bills of rights to carve out enclaves of freedom for peaceful, self-responsible individuals. But when a person ceases to be peaceful, and initiates the use of violence, coercion, force, or fraud against the life, liberty, or property of others, he forfeits the right to be left alone uncoerced by government. What I mean by the Laissez-Faire Republic would be the culmination of that development toward liberty and is the ideal republic toward which the original American Constitutional Republic was the most important step in history. For this to work in practice, there must be a whole body of reasonable, settled law -- such as the English Common Law and evolved Roman civil law -- and a general willingness to abide by the principles expressed therein in the settlement of disputes. Mainly, this means a well-developed system of law defining, recognizing, and protecting private property rights. (And by private property I don't mean merely real estate, but anything that a human or group of humans can own -- have exclusive right of control over, in whole or in part.) Private property rights provide a legal framework within which disputes may be settled and problems solved without the arbitrariness of might-makes-right violence. In other words, the idea behind a republic -- as opposed to a monarchy, or an oligarchy, or a democracy -- is that government will be bound down by Principle rather than guided by changing arbitrary Whims, whether it be the whim of one man, a small group of men, or a majority of voters of the moment. The ultimate choice is between Government by Principle or Government by Whim. Ah, but what principle, you may ask. The Laissez-Faire Republic would be based on and restricted by the principle of indiviudal rights of self and property of peaceful adult citizens, and rules of the game that would not be easily changed so that some players could not gain an artificial advantage over other players by such change. In short, I believe the Glorious Revolution of 1688 in England and the American founding fathers were on the right track, and the Laissez-Faire Republic would build on their relative success, learning from these experiences -- and perfect what they started and put into motion. I believe the founders were on the right track with the idea of limiting government by law and Constitution and checks and balances. Instead of abandoning their path, we should learn from and build on their partial success and make it better. As already covered, the followers of Robert LeFevre and Andrew Galambos seek totally non-political solutions to the problem of crime and coercion. For reasons already given, I (and most libertarians) reject that approach as inadequate even while we applaud any and all attempts to secure personal liberty from crime by means of improved defense-in-advance mechanisms. Let us now turn our attention to the second faction within the libertarian "anarchist" clique. The vast majority of libertarians and conservatives do see the need for political government in the area of local police, national defense, and a law court system or at least a Supreme Court. . . . and I agree with that position. At least for a period of time, libertarian economist Murray Rothbard pushed what he called "anarcho-capitalism" -- a vision in which all government functions would be performed by "private" agencies which would "compete" with one another in the marketplace. Although I do agree with the Rothbardites in the need for retaliatory justice, I maintain there is no such thing as a "market court"; I make a distinction between such market services as marriage counselling agencies and arbitration agencies -- which have no authority at all to enforce their recommendations on anyone and depend wholly on the voluntary consent of those clients who go to them for advice -- and true government courts which have the police power at their disposal to enforce their judgements and penalties on those convicted of crimes. And I see the need for a Supreme Court of some sort for the ultimate adjudication of disputes that have for whatever reason not been resolved in either market arbitration or lower courts in the government's jurisdiction. Keep in mind that as soon as any actor uses coercion or violence, for whatever reason, he or she ceases to be a purely market agent and becomes instead a "coercive entity" at least in the instant in which he or she acts coercively. This may sometimes be necessary -- as in the case of someone running down and tackling a robber trying to get away and holding him under Citizen's Arrest for the authorities; but, market entities are those characterized by non-coercive activities of voluntary exchange, and someone becomes something else when he or she goes beyond that and uses coercion for any reason. Coercion, even when used in a rightful manner in retaliation against initiatory coercion, is not a market means or mechanism. There is no such thing as a free-market policeman. There are private free-market night watchmen and guards -- but not market police officers. It is the failure of a few eccentric libertarians to make the distinction between market entities and coercive (criminal or political) entities that has led some to embrace what the late great economist Murray Rothbard dubbed "anarcho capitalism".... This was the system Murray Rothbard described briefly in the first chapter of his later edition of Power and Market and other writings. The great Austrian economist Ludwig von Mises called socialism "planned chaos" and he called anarchism "unplanned chaos" -- but it is clear to me that what a tiny subset within libertarian circles advocates as "anarchy" is just a floating abstraction which can never be implemented in the real world and any attempt to do so would result in the worst kind of statism. By failing to grasp the distinction between what is coercive and what is non-coercive (market), these few fringites have attempted to extend the argument for "privatization" from such non-violent services as mail delivery, education, fire control, electric power, and so on, (which virtually all libertarians believe should have been left to the private marketplace or volunteer efforts instead of political bureaucracies to provide) to such inherently coercive activities as police, government courts, and military defense. But a gang is not a market agency just because one calls it a market agency. If it uses coercion -- violence of any kind, either initiatory or retaliatory -- it is not a market activity of bilateral voluntarism. It is not a market agency, even though Dr. Rothbard, as brilliant though he was in economics, tried to present such competing vigilante committees and coercive gangs as an economic (market) alternative to political states. States by any other name still smell the same. And, indeed, what he advocated and called "anarcho-capitalism" -- and what I call "polyarchal vigilantism" or competing governments -- actually exists already in the world as a whole -- and always has existed. Since there is no ONE single world government, what we see in the real world are several "competing" political states, each controlling different geographical territories. I should point out that there is nothing in this political competition which benefits the citizen by producing more freedom; generally, the reverse is true: war -- the ultimnate political competition -- generally destroys individual rights and allows governments to usurp more power over their citizens. The point is that there is nothing in what Murray Rothbard advocated that would cause his (supposedly) "market" retaliation agencies to restrict themselves to the proper function of violence (i.e., to protect rights and not violate them). Competition in the political arena does not work the same way that market alternatives in the economic marketplace operate to serve consumers. Competing governments or vigilante gangs are not market agencies. They are coercive entities. This means that Rothbardian "anarchism" is not really anarchism at all since, in the real world, what he advocated would be what we already have now, and have always had: political strife on different levels vying for power. Equivocating with the term "competition," these "anarchists" fail to see that competing violent gangs and vigilante committees and lynch mobs are not the same as competing business firms which do not use any coercion at all. There is no limit to statism under this form of "competitive" anarchy. It is the war of all against all. Whether you call something the KKK, the Black Panther Party, the posse comitatus, or Murray's Anacho-Fascist Insurgency Association (MAFIA), if it involves the use of violence or coercion in any way -- either initiatory or retaliatory -- it is not a market entity and does not behave like one. The truth is that in the real world there is nothing that distinguishes Rothbard's "anarchist" agencies from political governments -- and they can be just as statist as any other political regimes can be. This path of seeking to "privatize" (marketize) functions which are inherently coercive is a dead end. It is a false alternative. Whether any group claims a "monopoly" on the use of force in society or not, if it uses force at all, it ceases to be a market entity and becomes something else entirely -- a criminal or political entity. It is the same old statism under a different label. 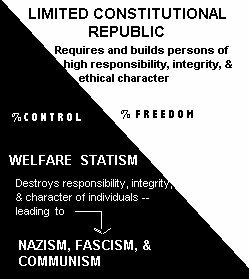 We don't really have any choice of whether we shall have government or no government, but only in what kind of government it will be -- a government restrained by Principle (some kind of republic) or a statist tyranny which has no limits to the whims which direct it. That is the hard truth which the self-styled "anarchists" (many of whom are still rebelling against their parents) should face. But couldn't the Rothbardian libertarians say the same thing about a Laissez-Faire Republic -- that it would not necessarily restrain itself to its proper duties as well? That, once set up, it could degenerate into politics as usual and growing statism? They might -- but I'd point out that it is much easier to exercise eternal vigilance over one, fairly local system of government than to have to worry about a dozen or a hundred during a situation of constant civil wars. Ask yourself: isn't it hard enough to keep an eye on the shenanigans of the current Administration and the Congress here in the United States -- let alone 150 to 200 some odd political regimes around the world? Those who advocate "anarchy" (competing states) don't offer a better way or any alternative to statism at all. It is the same old statism. The "competition" (war) between the United States of America and the Confederate States of America during the 1860s did not result in more freedom and less statism for most people. Even though the slaves (in only the seceding states) were freed, the states lost most of their sovereignty as the consequence of the War Between the States and this centralized power in the national government began increasingly to intervene in the economy as never before and in the decades following the U.S. system was changed by adding such statist fixtures as the Interstate Commerce Commission, a national graduated income tax, the Federal Reserve central banking scheme, and other "populist" or "progressive" measures of the socialistic Left. Even from a purely public relations perspective, those libertarians who wave the black flag of "anarchism" tend to alienate those Americans who might otherwise be interested in seriously considering the libertarian approach and exploring it as the principled but realistic, workable alternative to the various forms of political interventionism and socialism. The message should be: the opposite of statism is laissez faire, not anarchy. If anarchy is merely the absence of government and political activity -- as contrasted to the competing governments and warlords that the utopian "anarchists" seem to envision -- then we already have it. That kind of "anarchy" presumably exists in the international waters of the open seas outside of the 12-mile territorial limits of nation-state countries. If the absence of government were such a libertarian paradise, wouldn't we expect businesmen of all sorts setting up shop in those open waters of the high seas? No taxes, no regulations, and no political controls. Certainly, we have the technology today for people to live and work on and under the seas. Yet, we do not see this rush to develop the oceans or the seabed by profit-seeking businessmen. Why? I suspect it is mainly because there are no private property rights there -- no way to protect private property rights from being violated (by either pirates or gunboats from regimes such as the King of Tonga) because there is no government there to protect them. Freedom rests on private propeprty rights and the rule of law -- and those values and institutions cannot be expected to survive if unprotected. Those sincere libertarians who naively call for "anarchy" are just going down a dead end that leads to statism, not liberty. The American founders were on the right track in their attempt to limit the scope of government by means of law and constitution. We should take off from their lead and devise even better ways to limit the scope of government to the policy of laissez faire. I salute the great genius James Madison and his noble endeavors as Father of the Constitution. I salute George Mason, Thomas Jefferson, John Adams, and the other Founders. I think they were on the right track. Constitutional checks and balances are essential aids to keeping government in its proper place. These constitutional mechanisms are among the most important means used to help limit government to its proper role in order to achieve and maintain the end of freedom for peaceful citizens. They seek to stop or at least slow down an overall statist impulse by pitting the interests and natures of human beings in the political arena against one another in such a way as to avoid any one man or group of men centralizing enough political power to tyrannize over the rest of society. Sometimes these schemes work and sometimes they don't, but the idea behind them was and still is a great one that we should not abandon. A widespread respect for law is necessary for a constitutional republic to function in preserving liberty. Unfortunately, when law is increasingly abused by Whim, people begin to lose respect for law, and when that happens, the cause of liberty loses ground and society may degenerate into an even worse tyranny -- as what's left of a constitutional republic collapses into some form of Whimarchy. Perhaps we can come up with even better checks and balances to better limit government and keep corruption and tyranny at bay. Perhaps someone will invent an ingenious system of checks and balances so carefully keyed to the government's revenue devices that whenever public officials tended to go beyond their proper functions and would begin to encroach on the liberties of the people, the revenue to those officials would quickly and sharply decline in response. In other words, wouldn't it be great if the revenue to government was somehow made to be inversely proportional to the extent that the government tried to go beyond its proper authority, and would drop off dramatically if and when government officials usurped powers they had no right to claim? Of course, it would! But, how would one set up a system to work like that, a system made up of human beings, with all their various drives and ambitions and intentions? No system of checks and balances is likely to be perfect. The Constitution does not enforce itself; it is writing on parchment. Whether the system works or not depends on the people in it, and their reverence for the rule of law and loyalty in upholding the Constitution and Bill of Rights. I would like to believe that today we have a clearer idea of what laissez faire is and what it requires, and that clarity of goal on the part of a sufficient number of people is our greatest hope and assurance of success. If enough people can keep their eyes on the real "eight ball" which is at the core of freedom for all peaceful adult citizens, namely, the proper recognition and protection of the true rights of Self-Ownership and Private Property as the sacred principles on which individual liberty rests, then they will not lose sight of that precious goal for which constitutional checks and balances are among the means for achieving. Ultimately, the price of liberty is eternal vigilance to keep government in its proper place -- and this requires a sufficient number of people who understand what that is and what it requires. Ayn Rand showed us the way to make this possible by explaining that politics does not exist or evolve in a philosophical vacuum -- that the kind of political system a culture has will tend to depend on the kind of philosophical and moral foundations which dominate that culture. A culture mired in the soil substrate of irrationalism and the ethics of human sacrifice will almost certainly sprout a collectivist tree with tyrannical, statist branches. On the other hand, a culture with a sound foundation and topsoil of reason and individual rights will more naturally support the Tree of Liberty and constitutional government -- one that CAN be monitored with vigilance so that freedom can be jealously guarded from usurpation. Such a system would be the Laissez-Faire Republic which I advocate and which I believe is doable in the real world. Unlike socialistic central-planning oligarchies or the unlimited statism of anarcho-whimarchy, the Laissez-Faire Republic is based on and is consistent with the nature of reality and the nature of man, and is therefore approachable in the real world and ultimately practicable. maximum of political interventionism (and minimum of freedom). government intervention regardless of the FORM of government.